Greetings and salutations, everyone; yes, once again it is I, Mani the purebred border collie, filling in for the guy I live with, and here to bring you up to date on the latest news from our garden and its environs. It was Chess who first used that word, but I’ve used it more. You may remember me from such “environs”-using posts as “Escape Claws”, among at least one other. Here I am in a characteristic pose. I think you can see what happened last night. Before it snowed there were some things in flower which got their pictures taken. The iris, Iris rosenbachiana ‘Tovilj Dara’ is always photogenic. I don’t know if I’ve said this but there are some juno irises which are easy, like Iris bucharica and aucheri, some which are difficult to grow but you can’t get them anyway so it hardly matters, and some which are easy if you plant them in just the right place but now you can’t get these either. This one, with a lot of other junos, is growing on a little hill in the “way back” next to the Employees Only section, in a location where it doesn’t get much sun until early March. Iris rosenbachiana used to come up in January here, and that was the end of that. I don’t think I need to say why. Not all bulbs are tough like snowdrops. 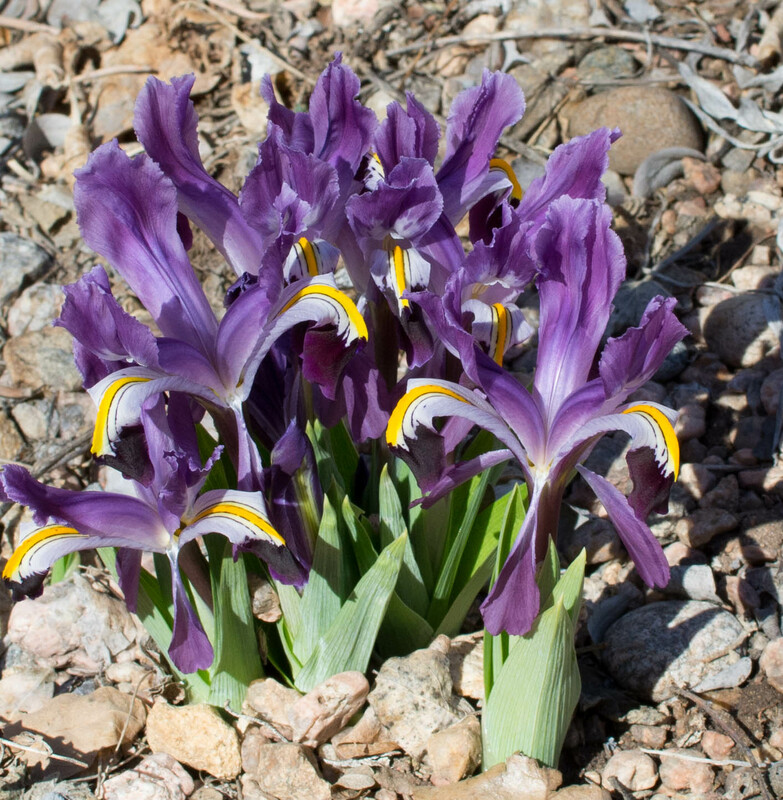 Apparently some people, like botanists, think this is really Iris nicolai or Iris popovii. The junos are really cool; I did a post on them a while back called “Day Of The Scorpiris”. But you do have to make sure that the ones that like to come up very early don’t. There are lots of cyclamen in flower here now. Cyclamen coum. They’re actually about three weeks late because the soil froze. Now it’s thawed out and everything seems fine. On our walk the other morning there was a lot of barking at something from across the field and we looked and this is what we saw. 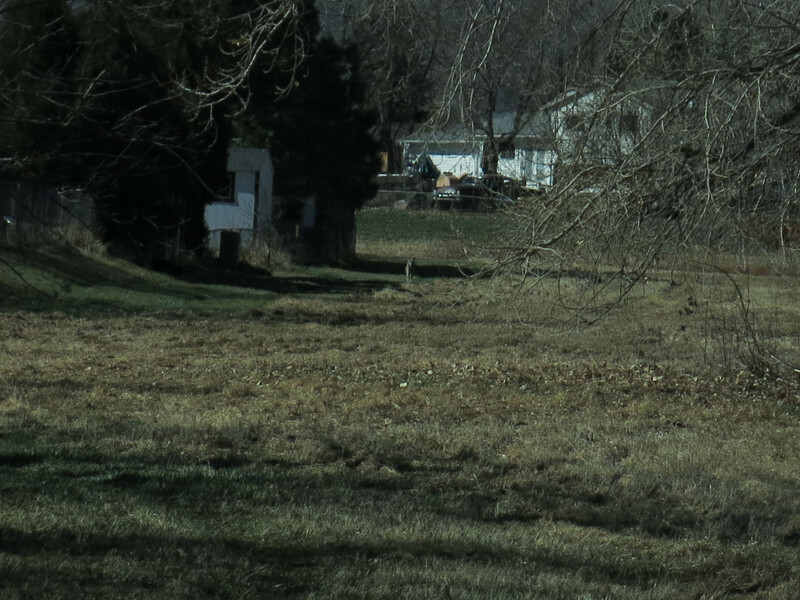 The barking was coming from off to the right in this picture, from a yard you can’t see. 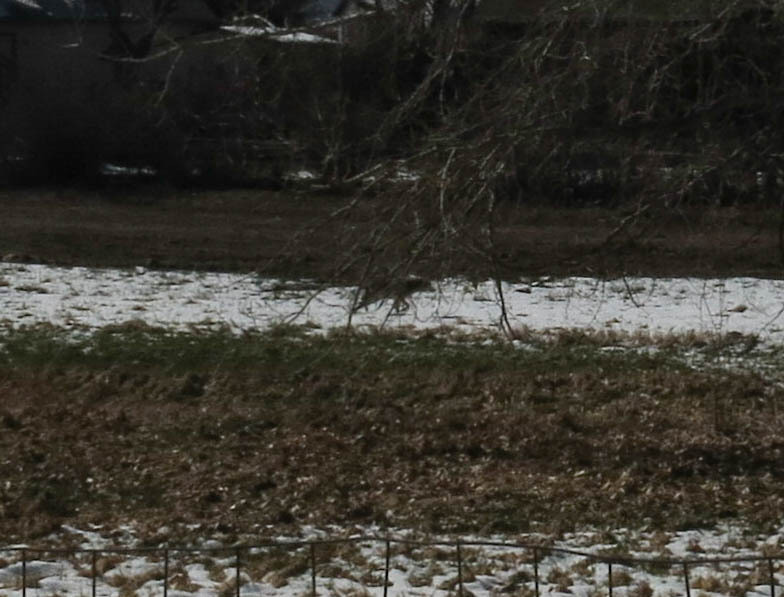 The coyote watched us (me, really; I’m the deadly threat, of course), then turned around and went home. The guy I live with said he felt sorry for it. He knew exactly what it was like to want to do something but feel too shy or awkward to do it. He told me he’d only been to a restaurant all by himself maybe three times in his life, and all of those times in the last nine years. 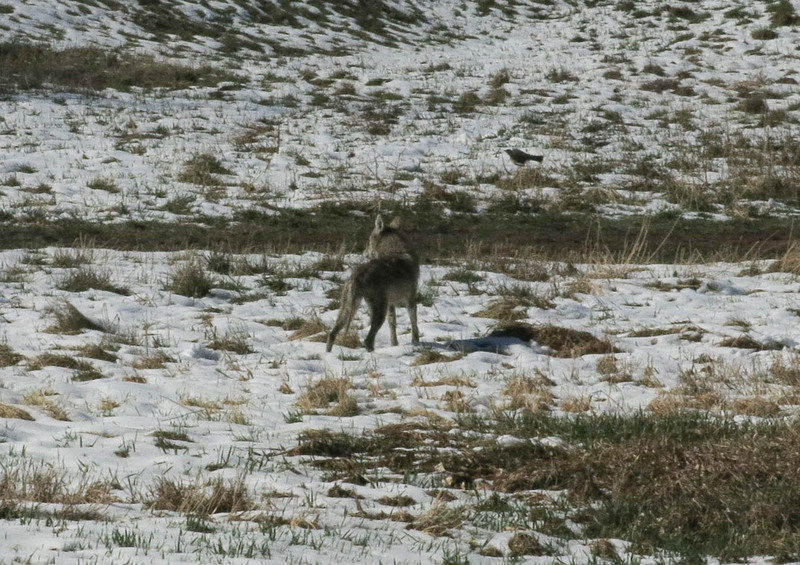 Today the coyote came back. The dial on the camera had been turned too far so the pictures are dark, but you get the idea. I got to run back and forth in the mud, which was fun, except then the guy I live with said to look at my feet, which I did. Some work, of an unknown kind, is being done in the northwest corner of the garden. This is maybe the most nondescript part of the garden. Even ramshackle. It was of course the first area to be dug, and so has been neglected for about twenty-five years. But something is happening there now. (Even though it might not look like it.) Well, the work isn’t happening right now, because it snowed last night, but I’m not being very chronological in my post today. But that big post on the right is now much shorter; it was sawed day before yesterday. We walked along and could see movement in the canal. The guy I live with said there was a crawdad fight and so I went down the bank a little, just to look. The guy I live with said these were really big crawdads. If you read the post I mentioned earlier, “Escape Claws”, you’ll know that I came sort of close to being pinched by a crawdad a couple of years ago, and so he said I couldn’t go all the way down into the canal bottom, or bed I guess, and look at the crawdads, because the next thing I knew we would be racing to the vet’s with a crawdad pinching my nose. It would seem all serious and everything but eventually everyone would laugh, except me, and then people would snicker for years afterward when they told the story of the crawdad and my nose. I’d probably have a scar, too. So we just looked at them. I know this has been a really rambling post, but today seemed like a good day to be ultra-rambling. I’ll leave you with a picture of me when I was much cleaner than I wound up being today (though I did go into the canal to wash my feet). hung on the wall someplace special. It is beautiful. Hi Mani! You look very regal in the first picture. The king surveying his domain…. I love that cyclamen cluster. The flowers are nice but the leaves are particularly striking. Which variety is this? Coyotes are fine creatures. I hear them here in New Mexico and love their call. I wish people would leave them alone instead of treating them like a constant threat and trying to kill them. I’m sure you understand. I like it when your posts ramble! Sort of a stream-of-consciousness style. Bravo! 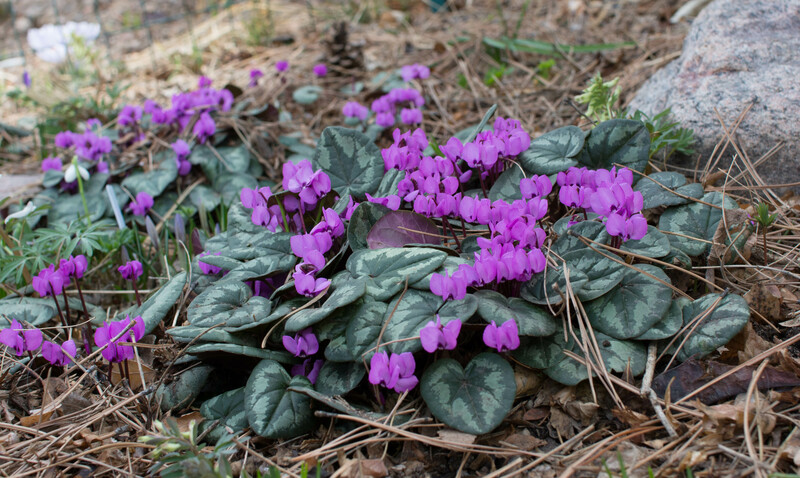 Those are Cyclamen coum; the easiest species here. Mani, I too can’t get over that first picture of you. Maybe on the next snow day, you can ask the guy you live with to show you an old Lassie rerun? You look marvelous! Thanks. It’s snowing again, right now. Not sticking, though. I don’t know if we can find Lassie on our TV. 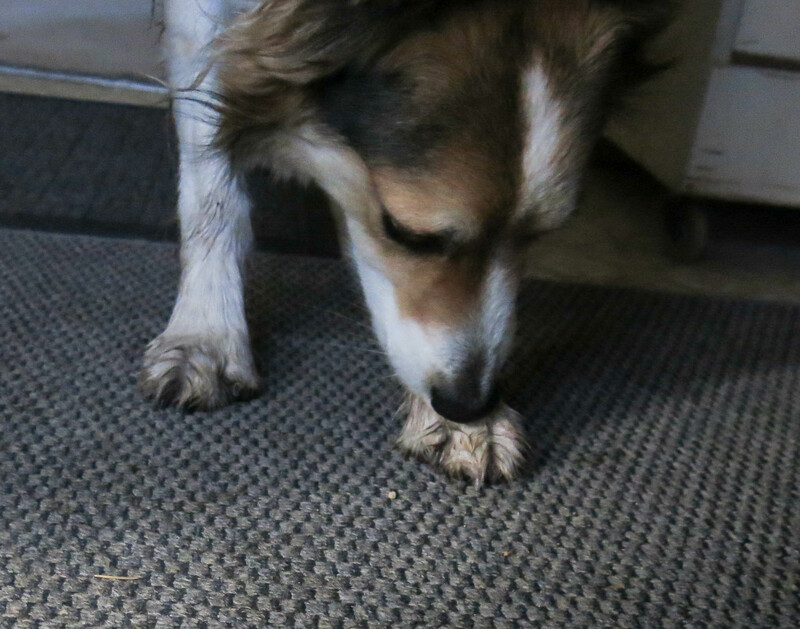 Believe me Mani you really do not want a crawdad gripping the end of your nose. No, it sounds pretty painful. It seems that I have not heard from you in quite a while. It is good that you are back. That crawdad really does look big. It would probably be pretty good. They are not so big or good here, and we are not supposed to eat them, but we do anyway. I think it is more work than it is worth. Those in the Guadalupe River in the Santa Clara Valley are even more toxic because of the mercury. They certainly do not get eaten. 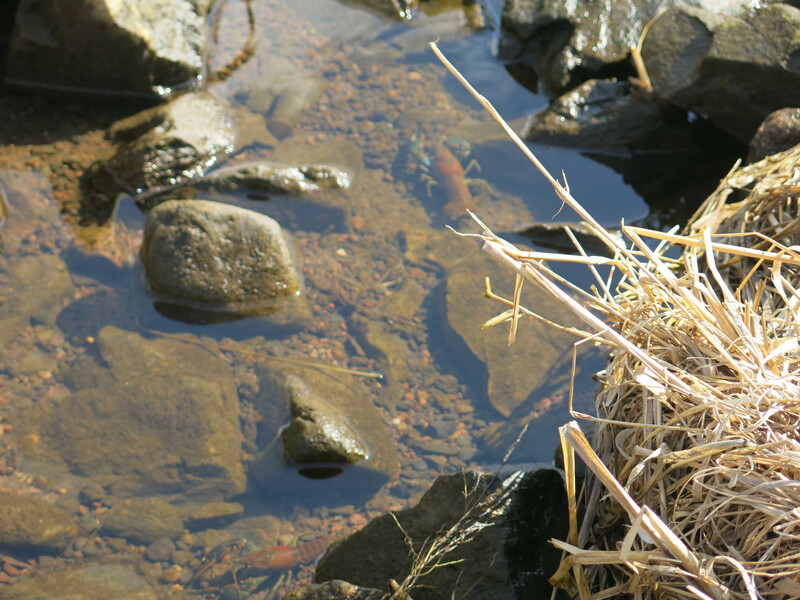 The guy I live with said the water in the canal comes from the mountains so might be good, but he doesn’t think crawdads are all that edible. There were several that size, in the canal. They were probably that big because no one eats them! 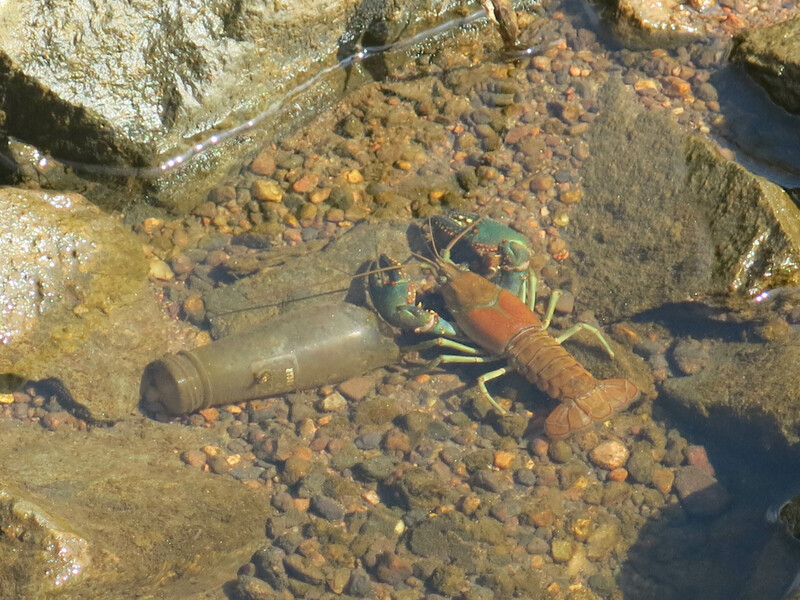 I happen to like crawdads, but of course, they tend to accumulate any toxins that happen to be in the water, which is why they are toxic in Guadalupe River. It flows from what used to be the second largest mercury deposit in the world. Well, the great blue heron used to snack on crawdads, so maybe now that the word is out, the heron, or herons, will return. The guy I live with said that while ate a frog or two way back when, he wouldn’t now, for fear he might croak. The guy you live with does not seem to have discriminating taste either. That photo of Mani at the top of the post…WOW! Fantastic. Breaking in to say: hey, Danger Garden, I just consulted your splendid post on 1935 Balboa Park cactus garden for my California Garden article. And now here you are again in one of my favorite places consorting with a favorite dog! Yes, you do photograph well, Mani, and snow becomes you. You look like the dog to appreciate those energetic iris and the adorable cyclamen. 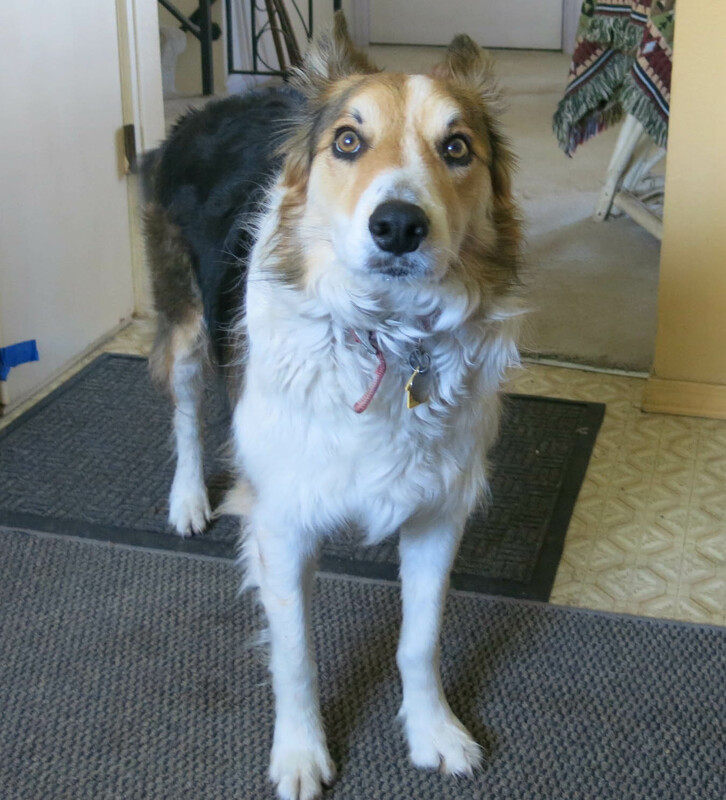 Where I grew up as a girl – sadly, border-collie deficient – Crawdad Crick ran in back of the avocado grove and the hiking there was delightfully sage-scented. You never mention the fragrance of your walks, and now I wonder. Can you smell cold snow? I’m sure you’ll keep us informed of the progress of mysterious doings. My guess is that patch is shortly to be lifted from the nondescript. 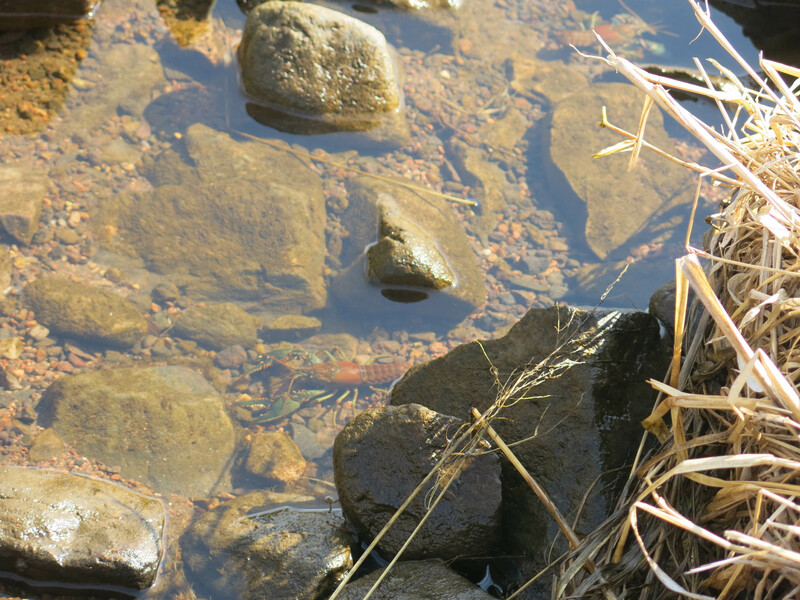 Oh, and your crawdad canal remarkably resembles my crick. And that is one sweet-looking coyote. 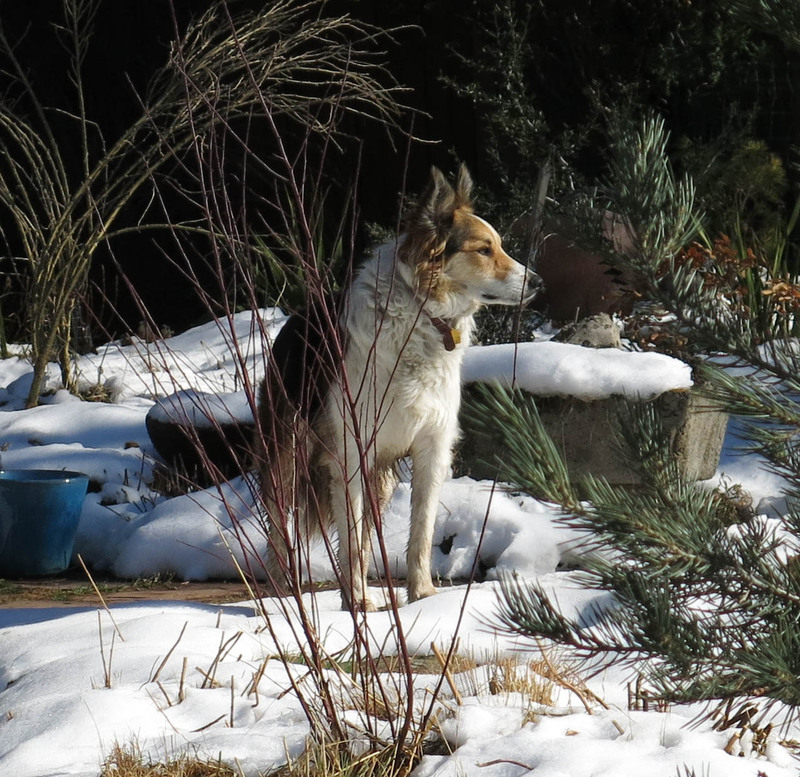 That would be a great country-western lyric, “Crawdads and Coyotes.” Maybe you could bark along. Thanks. I am pretty photogenic, am I not? It often mostly smells of laundry detergent on our walks. And everywhere else, except in our house. 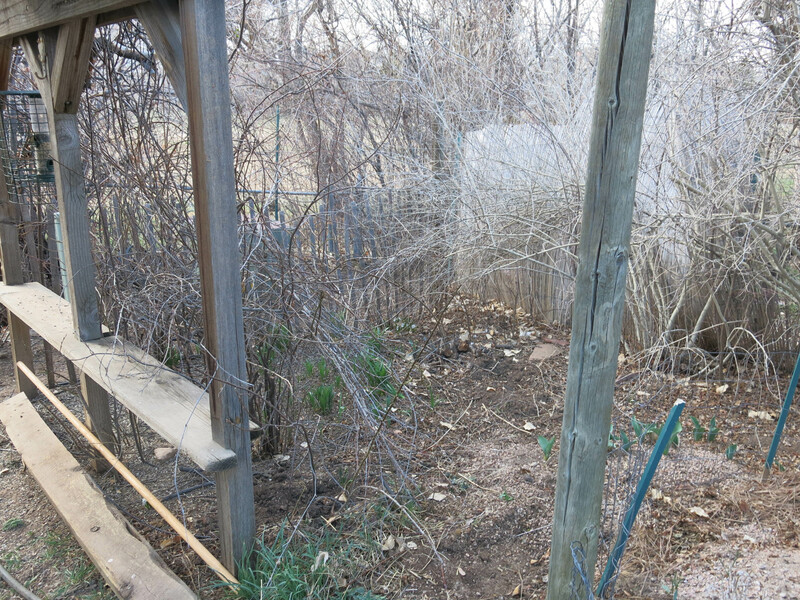 I’m not exactly sure what’s going on in that one corner of the yard, but something is. Or was; it’s been raining and snowing since about three this afternoon. It’s quite possible that nothing will be done other than the place just spruced up a bit. Oh my that Juno is striking. Wow. Some people claim the crawdads are delicious. Outside of a gumbo, I’m not sure about that. No, well, there’s no accounting for taste.